For me the voice always has been my biggest inspiration for my trombone playing. Listening to Frank Sinatra, Barbra Streisand, Placido Domingo or my flamenco Hero el Camaron de la Isla were in the beginning of my career my guidance in sound, phrasing, intonation and timing. A few years ago I heard Lara Fabian for the first time and was absolutely flabbergasted by her singing. This interpretation of Albinoni’s famous Adagio shows all her vocal qualities optima forma. Total control, virtuoso, perfect intonation and super emotional, really telling the story. I love it. I’m so jealous about today’s trombone related resources you can find on YouTube. You can imagine this wasn’t available 45 years ago. My friend Joe Alessi has some absolute amazing youtube videos online with tips how he does it. I would say to all of you look them up and learn. 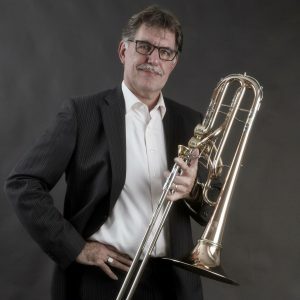 Joe is not alone, also another giant player like Ian Bousfield offer an online method but there are many more videos online of all sort of trombone topics. At 62 I’m still learning so much from all these todays resources available on YouTube. My first real interest for the trombone started after listening to the LP’s of Urbie Green and 21 trombones my father brought with him from the States after a tour with his orchestra. That amazing sound of 4 sections of 5 trombones each accompanying Urbie’s incredibly was so inspiring and it still is. It was for me so nice to participate in this “Urbie Green tribute” project of the New Trombone Collective. With 4 amazing trombone jazz soloists, Bart van Lier, Jiggs Wigham, Mark Nightingale and Nils Wogram in the role of Urbie and us as the 20 “World Greatest” as they were named on the original LP’s playing Urbie originals and new compositions for this formation. A dream come true and I hope you will enjoy the live registration of this project’s concert as much as we enjoyed playing it.